This weekend I decided to return to the scene of my previous crimes in the name of croissants and have another go at them. 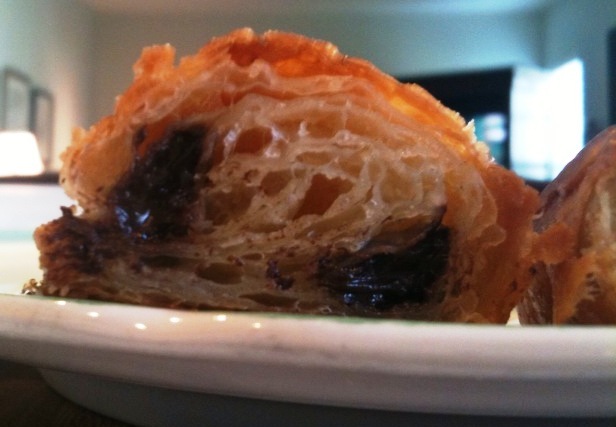 I've been spurred on in part by hansjoakim's magnificant croissants he shared with us a few weeks back, as well as by ensuring conversations involving him and ananda about differences in puff pastries and in the levels of butter and lamination involved in each. One lesson I took away, is that my previous attempts have involved greater amounts of butter than is standard for croissants - about 38% of total dough weight, versus what I now understand to be 25% in classic croissant dough. With this in mind, I went back to the drawing board and adapted a recipe from Dan DiMuzio's excellent textbook, Bread baking: An Artisan's Perspective. It is quite similar to that of SteveB's which can be found on his blog, bread cetera. As with previous attempts, I've deliberately frozen the croissants after shaping. When needed, I move them from the freezer to refrigerator for about 12 hours (usually overnight), and then allow them to proof at room temperature for about 2 1/2 hours before applying eggwash and baking. I've also followed DonD's method of baking, which involves starting the bake with steam at 425°F for 5 minutes, then turning the oven down to 400° for another 5 minutes, and finishing up at 375° for 5 minutes. 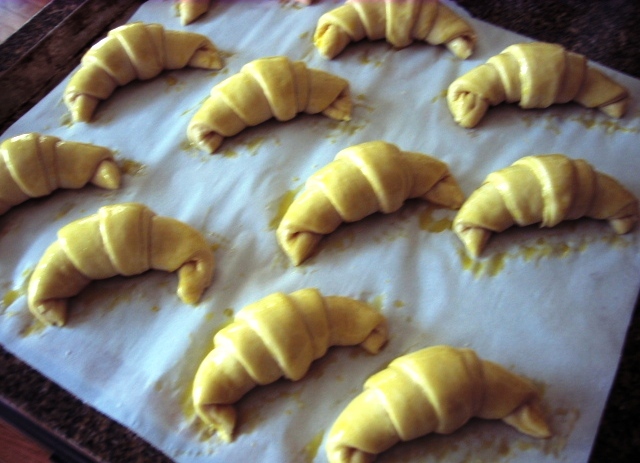 The resulting croissants turn a nice golden color, while the interior remains moist. I also thawed and baked a half dozen croissants previously made with the higher butter percentage of 38% of dough weight to see how the results differed. (And I threw in some pains au chocolat as well). Thus armed, I head over to my brothers, confident that between he and his wife and my nephew and niece I'd have an objective tasting audience :>)... well, at least an enthusiastic one. As you can see, the lamination is pretty distinct and my first reaction was that the decrease in butter shows in the crumb structure. Not bad, but it seems clear to me that the crumb is not as well-defined, and I attribute this to the higher butter content. (Although, I must confess, strictly from a taste standpoint, I prefer these - they just melt in your mouth). So, this has been an interesting and very instructive introduction for me to laminated pastries, to which I owe thanks again to hansjoakim, ananda and DonD for sharing their knowledge, insights and enthusiasm for this most wonderful viennoiserie! Larry these are gorgeous..I am drooling all over my keyboard...I could eat puff, danish, croissant pastry everyday...I wish :-) Well done! Latest attempt is much improved in my eyes; lamination is spot-on. I appreciate what you say about the taste of the higher butter specimens..but, these are "yeasted pastries". They utilise a combination of aeration from steam pressure, and aeration from yeast. Too high a fat level is counter-productive. 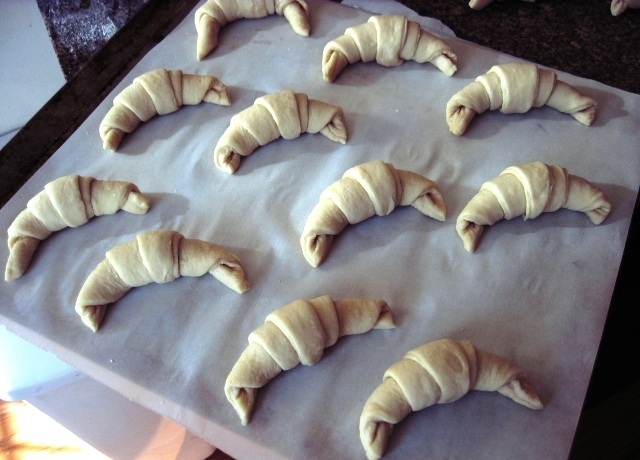 Did you freeze any fully-baked croissants? I'm still of the opinion that this is the best way to store them...unless you possess a high class commercial retarder. Do you have these excellent machines at the bakery where you work? From your post I'm thinking you may be a bit sceptical still about re-heating fully-baked croissants; but, you really should give it a go and see. I bake hotter than Don; however your croissants have plenty of colour, so stick with your current profile. Shaping: I'd like to see more "stands" on your croissants, and more pointed feet. This means you need to tease out the triangular dough piece more, and shape it much tighter. It may mean resting the ready cut pieces more before final shaping. Is this of any interest as feedback? Thanks Andy! Yes, shaping needs work. I'm still getting familiar with the 'right' thickness of the final dough for maximum stretching and subsequent rolling. When I can get a couple more strands I'll feel good about it. I have indeed frozen fully baked croissants (my freezer is awash presently in baked and unbaked croissants from all my experimenting). After a thaw and with just a quick spritz of water and about 5 minutes in a 300° preheated oven, I find they regain their crispness without becoming dry inside. From a storage perspective (I'm talking at home here), it's easier to freeze them unbaked - I don't have to worry about crushing them by accident. In terms of flavor and crispness, however, I can't detect any difference whatsoever. Thanks Don! As much as the buttery croissants are irresistable, I think the standard croissant is preferable - it has more texture. And from a commercial (i.e. cost) standpoint, it's a no-brainer. It's an ongoing process. But with each iteration I have less hurdles. Yes, you've found the crux here. I run my fingers and thumb around the whole of the dough piece to ascertain guage. Thumb on top of the dough, index and middle finger underneath. Run these carefully around the edge of the dough. Too thin is most unsatisfactory; too thick yields boots instead of delicate pastries. Good to read of the breadth of your experimentation. Whatever works best for you is where you should go. Are you familiar with commercial retarders? In UK we have Fosters and Williams making specialist units. The big boys use retarder-provers, of course! I've only baked croissants a couple of times; I try to avoid high-fat food for real health reasons (bypass surgery twenty years ago), but you've inspired me. Look out Lipitor, you're about to be challenged...again! I suspect an occasional croissant won't clog things up. Have at and thanks! 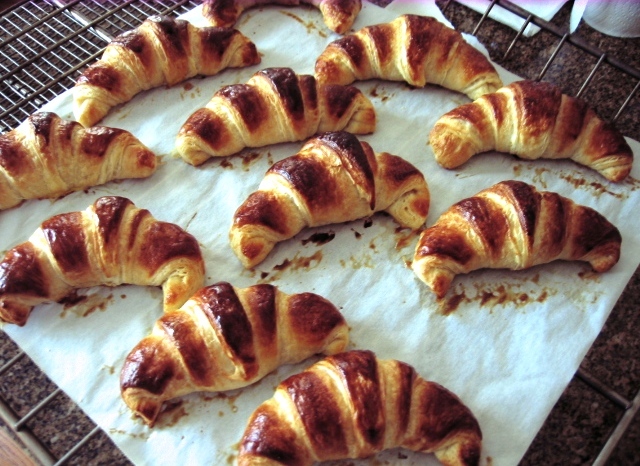 Congratulations on stellar-looking croissants, Larry! The crumb in that 25% butter croissant looks great! I am surprised by the difference between the two crumbs. Do you think the reason is due to butter being more prone to leak between layers of dough when you have as much as 38% butter for lamination? You're below the butter amount used in puff pastry (50% of dough weight), but the yeast in the dough makes it much more difficult to work with than ordinary puff pastry (which is relatively easy to laminate). Thanks for the comment - especially coming from a croissant master! It really is a noticeable difference in crumb. I attributed it to butter, but it could be that the yeast in the dough is a factor. The other element that might be relevant is that with my latest batch I rolled out the dough to form a square 16" x 16". Previously, I was rolling out the dough to form a rectangle 15" x 21" which is nearly 60 sq. inches greater. 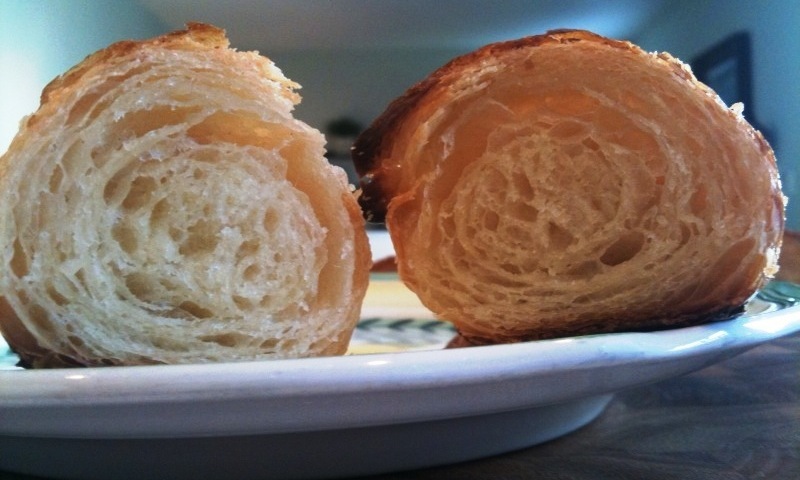 So the 38% butter croissants have thinner layering which might allow leakage. In any event, it's much easier working with the 25% dough and the 16" square, so I plan on sticking to that in the future. I started out using the amount of butter called for in McManus' recipe but found that it was too much and that some butter seeped out during baking so I cut back to 30% of butter to total dough weight and found it to be a happy medium. Don, I recall you mentioning that you'd cut back on the butter. After baking the croissants, I could tell immediately just by looking at the parchment paper which ones had 38% butter and which had 25% butter. Too much of a good thing! Just a quick question. You said above, you backed off to 30% of butter to total dough weight. Did you mean of total flour weight? I added the weight of all the ingredients to get the dough weight and the butter percentage works out to be 28.5% to be precise. My sugar percentage is 5.35% of dough weight. My solution is friends and family. I've yet to have them complain, "no, no, please no more bread." And a lot of breads hold up quite well if frozen, so I don't have to worry about eating everything I bake immediately (baguettes, ciabatta and some others not included of course). But I understand where you're coming from. If I attempted to consume even a quarter of what I bake at home, I'd turn into the Pillsbury doughboy pretty quickly!